It was very depressing to be in Mudon seeing economically helpless people and knowing that I can't help them. Many people who are economically doing fine are those who work in Thailand, Malaysia or Singapore illegally. Our town, Mudon, is very close to the Thailand border and it is very convenient to go to Malaysia and Penang by motorboat. I will write more about my trip and my town later if I have time. Being back in Rangoon (Yangon), I have been very busy lately teaching a youth class at the Summer Bible School from Mon Baptist Church and computer classes at Nant Tha Gone Karen Baptist Church. I read an article from the Myanmar Times. It was about housing project in Rangoon (Yangon). Asia Express is a local company doing housing project. U Maung Maung, the chairman of Asia Express said that the 60x80 square feet land plot ranges in price from Kyats 80 million (approximately equal to U.S. $ 80,000) to Kyats 100 million, depending on how close they are to the main road. He also said that the company charged about Kyats 45 million (U.S. $ 45,000) to build a two-storey house with a floor area of about 3,000 square feet. Zaykabar is also a local company, which is working on a condominium project. According to the article, the company sold 21 of the 150 units available in two days of advance sales earlier this month. According to Daw Mi Mi Thein Tan, the general marketing manager at Zaykabar, the company had received hundreds of telephone calls, faxes and emails from potential buyers. She added that most of the inquiries were from Burmese working abroad. -- Detached housing attracts buyers (2003, March 10-16). The Myanmar Times, Volume 8, No. 157, p 9. Honestly speaking, I can't afford to buy The Myanmar Times because it costs Kyats 500 (50 cents) for an issue and I make only about Kyats 15,000 ($ 15) a month. I am reading the issue that I borrowed from Dr. Chit Maung Library. According to what I saw and read, it is sad that our country is facing the most serious brain drain ever in history. Educated people feel no hope and freedom being in this country and only those who have no way of going out and those who came back from abroad remains here. The following is the social stratification as I have seen so far. Working-class families who make about Kyats. 1,500 ($ 1.5)a day (lives from pay-check to pay-check). The cost of living is quite a burden for these people. Middle-class families who own shops or small businesses. The cost of living is about the same as or a little bit below their income. Even if their income is above the cost of living, the inflation is killing them. 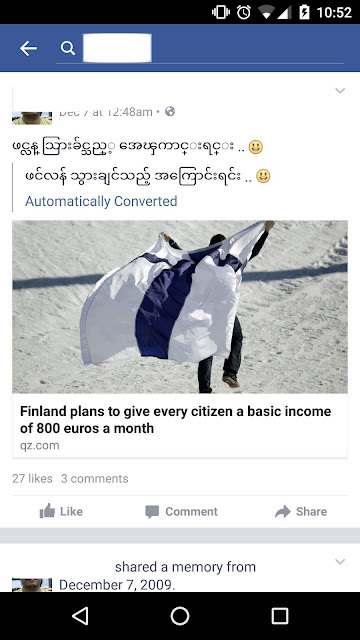 Educated people whose income is in Kyats. They are also struggling but they are similar to category 2. Families whose income is in U.S. Dollars. The cost of living is not a burden for them. They can live decently. People who are getting foreign aid. For example, one of their relatives works in a foreign country. They can live decently. People who are extremely rich with their inheritance. They usually own companies.